I joke about it but when my daughter was little, she never said the words "me do" when she was learning to tie her shoes, put on her coat, etc. Sometimes I wonder if I've done my daughter a disservice by doing everything for her as she grew up. If I have, it's purely out of love and being a parent is a service-oriented vocation", according to Dr. Gary Chapman in his book The Five Love Languages for Teenagers. Wow! No truer words have ever been spoken. From changing diapers to making sure my daughter has a non-holey socks and underwear...it's been 17 years of endless acts of service. "True greatness is expressed in serving. Acts of service freely given from parents to teenagers are true expressions of emotional love", says Dr. Chapman in his book The Five Love Languages for Teenagers. I am in a group on Facebook and I asked the question "Do you see your kids off to school every morning". The majority of people who responded, mostly moms, said "yes, absolutely and I make sure they have a healthy breakfast and lunch". According to the great doctor...these are acts of service that will pay dividends well into the future of a teenagers life. Sometimes we can find ourselves in a situation where either the parent or the teen thinks it's okay to manipulate the other. Manipulation is not love. Sometimes our teens will offer to do something they know we'll like, if they can get something in return. Parents also do this but it's not loving each other unconditionally if it's the basis for a relationship. Teenagers can also take advantage of a parent because they know their parents will do anything for them. This can be detrimental to the love connection between a parent and a child so be watchful of this type of behavior and call it out if/when you see it. The point is to have our teens feel loved and to express love to us as well. As they grow, we have to choose our acts of service wisely because there's a chance we could make them dependent and self-centered. When Claire was 10 I decided it was time she start doing chores and taking care of some of her own things like laundry. It was rough. Seven years later she is doing her own laundry, cooking some of her own meals like mac-n-cheese, toasting bagels, making sandwiches, heating up soup, assigned chores like vacuuming the house, unloading the dishwasher, taking the garbage cans to the curb...etc. They need to share in the household activities to contribute to acts of service for others as well. Do you believe acts of service is important for showing love to you teen? 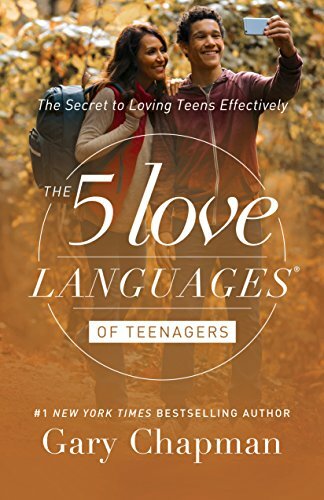 There's way more great information in the book The Five Love Languages for Teenagers if you want to hit the link below and order the book. Gary Chapman is a great author so check out more of his books when you get a chance.